Please Join Crew Treks on this expedition to not only the highest peak in South America but also in the Western Hemisphere. Along the way, you will travel trough barren Andean Valleys ford streams and encounter local wildlife. 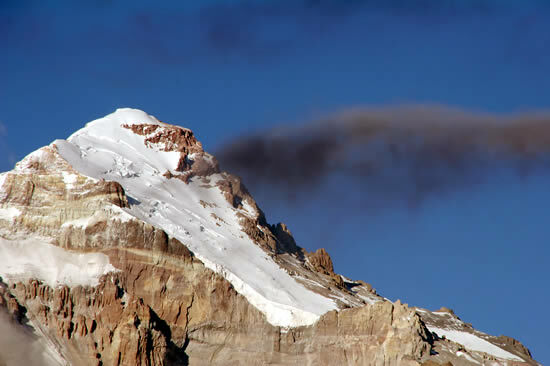 Cerro Aconcagua at 22,841 feet (6,962 m) long considered a stepping-stone in high altitude mountaineering is a non-technical climb, but its size and high altitude make it an all out expedition with all ramifications of high stakes climb. One must be in excellent physical condition with some experience at high altitude and under winter conditions. In the best interest of personal safety, success and team compatibility, adequate training and excellent physical condition are required. Prior experience with backpacking and camping is required. Climbers must be able to carry an average of 50lbs or more. Climbers need to be in excellent physical condition for both personal enjoyment and to be an integral team member. As part of the team, everyone will be required to assist in setting up tents, help with melting snow or other group related chores. If you are lacking any of the skills, please join one of our domestic trips or contact us to assist you with program. Day 1(January 14) Leave home and fly to Mendoza, Argentina. 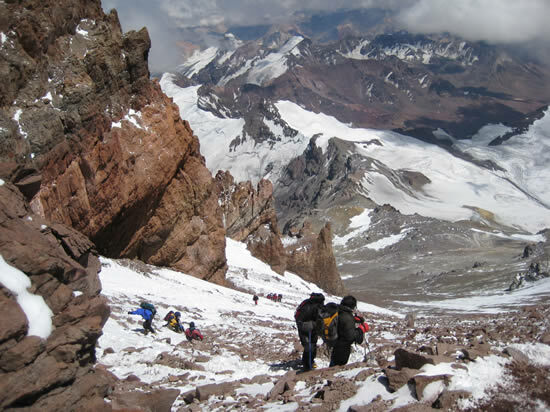 Day 2 (January 15) Arrive in Mendoza in the afternoon and secure climbing permits/overnight in Mendoza. Day 5 (January 18) After 2 days of hiking through colorful desert landscape we reach our Base Camp, Plaza de Mulas, at 13,800' Mules carry our gear. Day 6 (January 19) Rest Day at base camp, acclimatization hike or just rest. Day 7 (January 20) Carry a load to Camp I, Plaza Canada, at 16,170' . Return to Base Camp. Day 8 (January 21) Leave Base Camp. Move to Camp I. 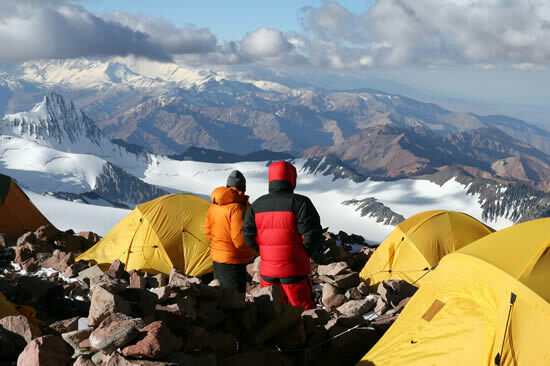 Beautiful campsite with impressive views of the north side of Aconcagua and alpine Cerro Cuerno. 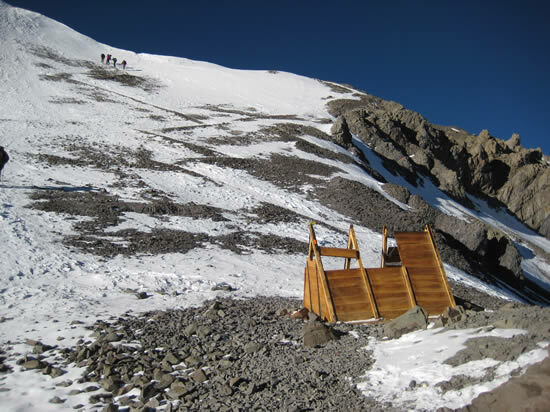 Day 10 (January 23) Carry a load to Camp II, Nido de Condores, at 17,820'. Day 11 (January 24) Rest at Camp 1. Day 14 (January 27) Carry a load to Camp III, Piedras Blancas or Camp Berlin (High Camp) at 19,200'. Day 19 (February 01) Descend to Plaza de Mulas, overnight and celebrate victory! Group gear, ropes, tents, stoves, etc. To enter Argentina, there is no visa requirement unless you are staying more than 90 days. If you are transiting through Chile you also do not need entry visa. The best way to get to Mendoza is either via Buenos Aires (EZE) or (better)through Santiago, Chile (SCL). Theremarest/Sleeping Pad-good quality; you will be sleeping on it for two weeks! Tennis shoes to walk around camp and to ford streams. Required Medications: Antibiotics-Cipro-for food poisoning/lower body infections, Amoxicillin-for upper body/respiratory infections, Aspirin-helps in acclimatization, Diomax-helps in acclimatization.